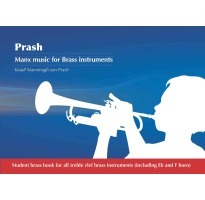 Prash is a series of books designed for use by the Isle of Man music service's young brass students. The books can also be purchased directly from Culture Vannin. Two student books (treble clef and bass clef) and four piano accompaniment books (in keys Bb, Eb, F and bass clef) have been published, each containing 34 solo pieces, some with optional duet parts, graded from beginner to Grade 4/5 level. The traditional melodies and songs were specially selected by Paul Hamilton (Head of Brass) for use in the Isle of Man Music Service graded exams and for other solo performances where own choice graded repertoire is required, such as the annual Manx Music Festival.